Tuskegee, Alabama, became the focal point for the training of African-American military pilots during World War II. Tuskegee Institute received a contract from the military and provided primary flight training while the army built a separate, segregated base, Tuskegee Army Air Field (also referred to as the Advanced Flying School) for advanced training. Support personnel were trained at Chanute Field in Illinois. The first class, which included student officer Capt. Benjamin O. Davis, Jr., began training on July 19, 1941. Rigorous training in subjects such as meteorology, navigation, and instruments was provided in ground school. 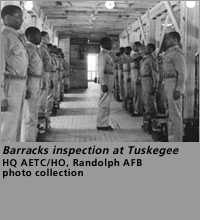 Successful cadets then transferred to the segregated Tuskegee Army Air Field to complete Army Air Corps pilot training. The Air Corps oversaw training at Tuskegee Institute, providing aircraft, textbooks, flying clothes, parachutes, and mechanic suits while Tuskegee Institute provided full facilities for the aircraft and personnel. Lt. Col. Noel F. Parrish, base commander from 1942-46, worked to lessen the impact of segregation on the cadets. Many cadets got their primary flight instruction at Moton Field, Tuskegee, from Charles A. "Chief" Anderson. The first class of five African-American aviation cadets earned their silver wings to become the nation's first black military pilots in March 1942. Between 1941 and 1945, Tuskegee trained over 1,000 black aviators for the war effort.